ProBox understands your need is unique and has a container to meet your space demands. Size, Security, appearance and options are important. Rent Today & Get A Free Delivery! Sizes and configurations apply to both the premium and economy ProBox storage containers. 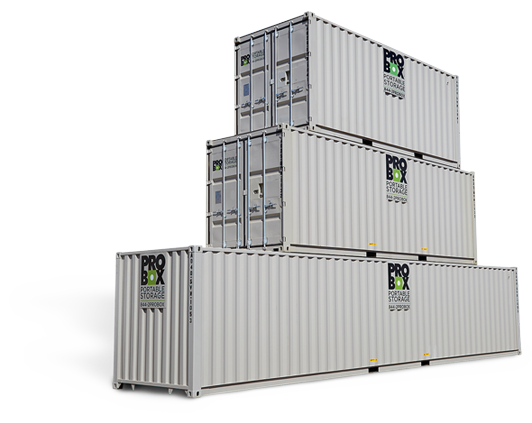 ProBox’s standard storage containers come with dual heavy-duty, easy to open, steel swing out doors on one end. ProBox containers are available with dual heavy-duty steel swing out doors on both ends for maximum convenience. Toggle through the tabs below to learn more or click here to download our brochure. This is a standard feature in all storage containers. The interior of your box will be clean! 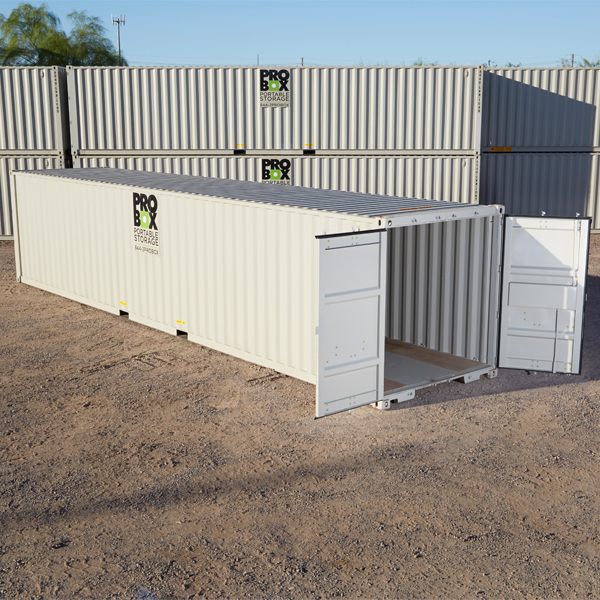 We rent and sell containers you can trust to securely store your most important assets. 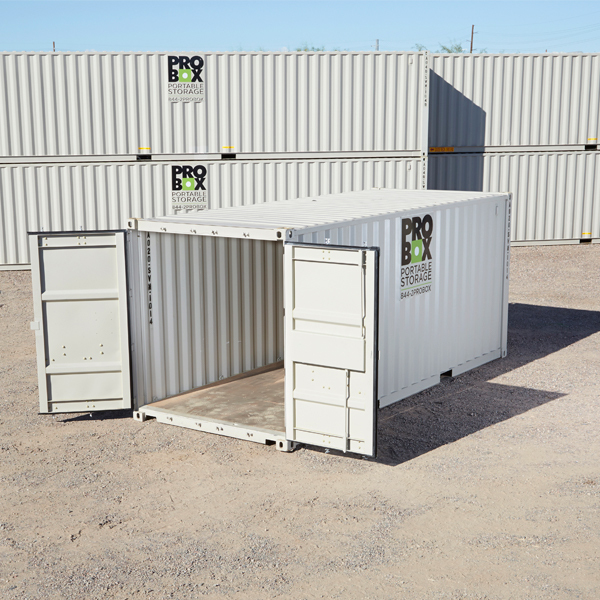 We rent and sell containers you can be proud to have on your property. And, when your work is done, just give us a call and we will arrange prompt pick up of all units. Thus, ensuring your workplace looks clean and professional. 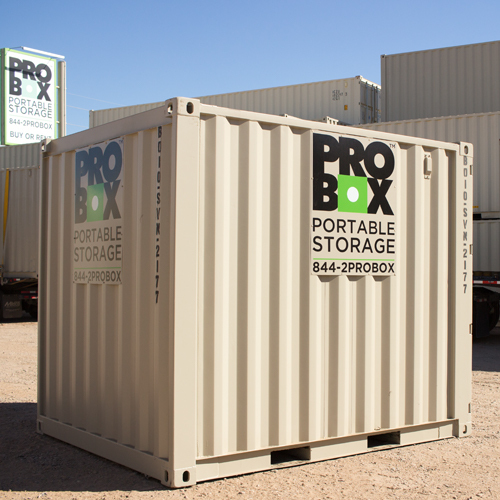 ProBox Portable Storage always provides competitive pricing on great-looking containers. 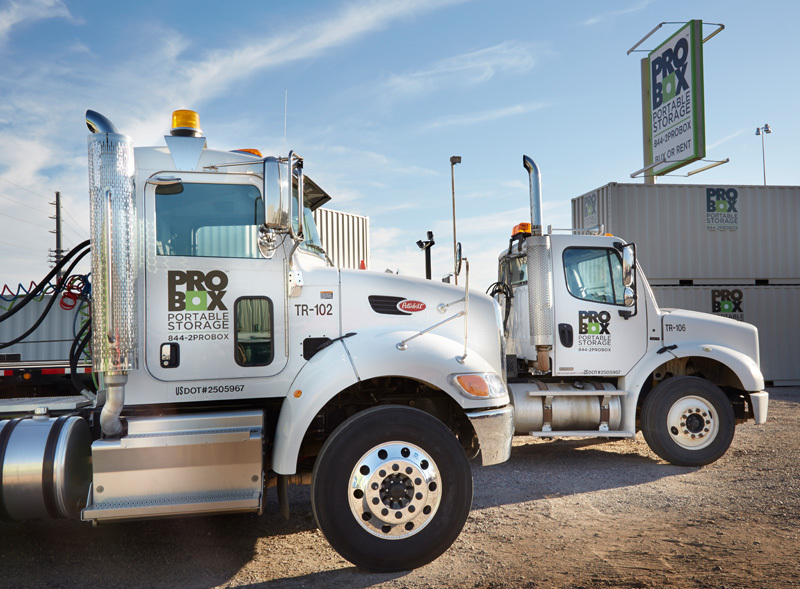 ProBox Portable Storage containers are delivered directly to your business or jobsite keeping your inventory and tools safe and secure on your property. Giving you easy convenient access anytime day or night. 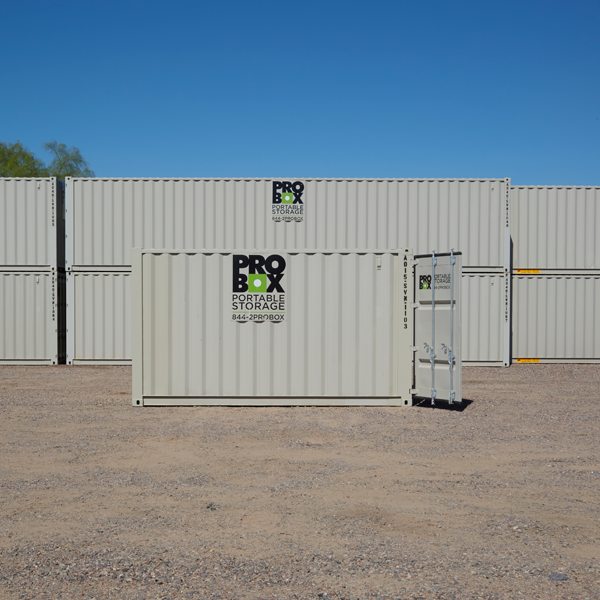 ProBox Portable Storage prides itself by being 100% transparent with all of our customers. Your bills will be simple with no hidden charges. 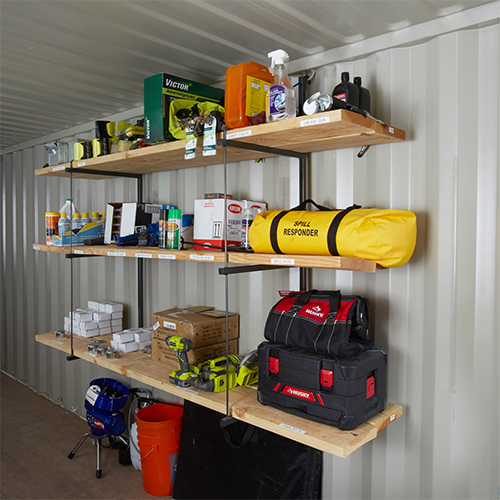 Make the most of your storage container by adding shelves to help organize your inventory. The shelving system has three shelves holding two pieces of construction grade 2” x 10” wood per shelf which produces a shelf that is 18 ½” deep. Each bracket has a load capacity of 1100 pounds and each bracket is rated for up to 550 pounds. 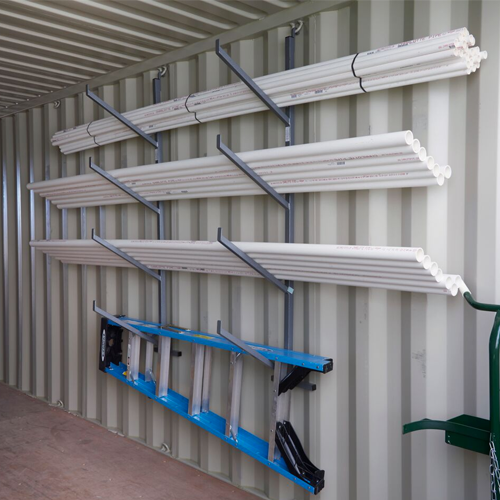 ProBox offers heavy duty pipe racks to store piping and other long materials. This maximizes storage space and keeps materials organized and off the floor. Each bracket has a load capacity of 1100 pounds and each bracket is rated for up to 550 pounds. A container ramp can make moving in and out of storage containers with handcarts quick and easy. Each container ramp can accommodate up to 750 pounds and has a non-slip surface. 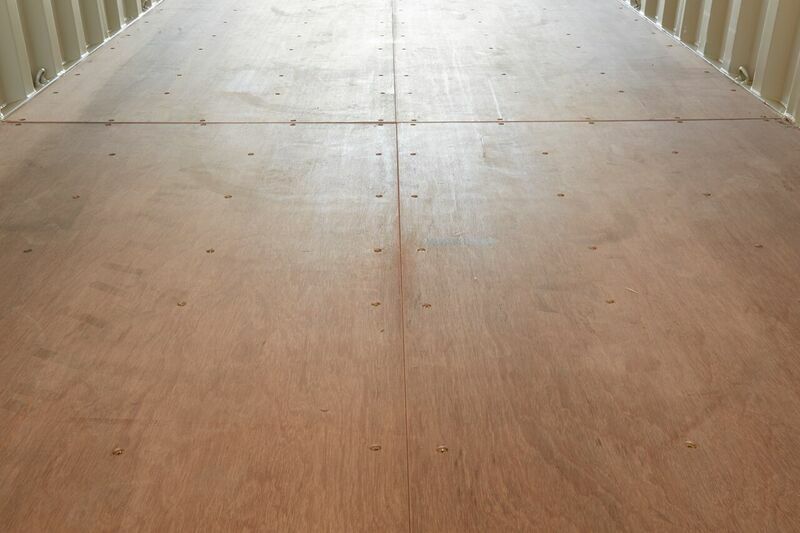 The ramps weigh 35 pounds and are 36″ long by 31″ wide. Call us today to find the best option. We take great pride in delivering the units on time and placing the unit exactly where our customers need the unit delivered – even if it takes extra time. In most cases we can deliver a unit to our customers within 24 hours. Our friendly and professional drivers will relocate your empty portable storage containers wherever they need to go. Just tell us where and when and we can make it happen. Because we are a locally operated business, we can react quickly to provide customized service to meet your needs. Our drivers call our customers before every delivery and pickup. Our salespeople are not in a call center and truly care about the local customers. Let us show you how we make our customers feel like family! If you are not completely satisfied your first month’s rent is free. Puck locking system for high security storage unit. We have your special event covered! Our boxes can be stacked to save you space. ProBox delivery is fast, easy and convenient. We stay out of your way! Tools, materials or even an A/C outfitted office. ProBox has you covered! Customize your ProBox for what works best for you! Your business will have peace of mind with the most secure storage in the industry! Our storage is built contractor strong! Secure storage that fits your needs! Our boxes are built contractor strong!